Mack Camera became the first camera store to sell The Light Caddy. Recently I had a job to photograph some displays at a furniture store so I brought our floor model so I review the product. I filled the case with my tripod, 3 light stands and 2 umbrellas. Using a carabiner I attached my softbox case to the same loop that The Light Caddy’s strap connects to. In the pockets I had extra batteries and some gaffers tape. When I was first introduced to The Light Caddy, Robert Medina showed us his inspiration for the product by comparing a Target bought Golf Bag to his case. 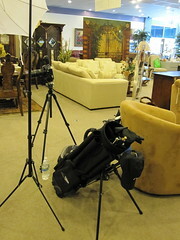 The interesting thing was that the Golf Bag would collapse easily when you put some weight on it. The Light Caddy does not. What it comes down to is this. The bag does the job. I was able to easily transport everything I needed for the job in 2 rolling cases. My camera and lenses were in my Think Tank Airport International rolling case and the lighting tools were in The Light Caddy. The legs on The Light Caddy made setting it down a snap! Moving around the furniture store meant grabbing the handle, watching the legs automatically collapse and rolling it to the next spot. Push the handle down and the legs pop out again. It doesn’t get much simpler. My only problem with this case is what happens in the rain. Robert has been working on ideas for a cover but until then I used a big garbage bag and rubber band to protect the inside of the bag and my gear from the rain. The case is very well built and designed. The simplicity makes it so easy to use. Your gear is protected and won’t fall out during travel. 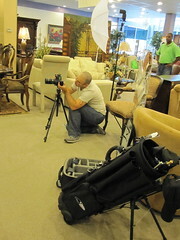 If you are interested in seeing the bag check out thelightcaddy.com or stop by Mack Camera to try it out yourself!